1. Functions: Hotel logo, Room Number, DND, Clean, Laundry, Doorbell. 2. Stability: Built-In overload protection, anti-Surge current and anti-lightning. 3. Appearance: LED backlight design made for night-time recognition. 4. Special touch screen design, five-in-one function. 5. Using laser printing technology, support customized design. 6. Crystal outer frame design, beautiful high-grade. 7. Use ABS fire retardant materials, safe and secure. 8. All setting parameters could be stored permanently. 9. Applicable Range: Hotels, Guest Houses, Mansion, Clubs, Office Building. 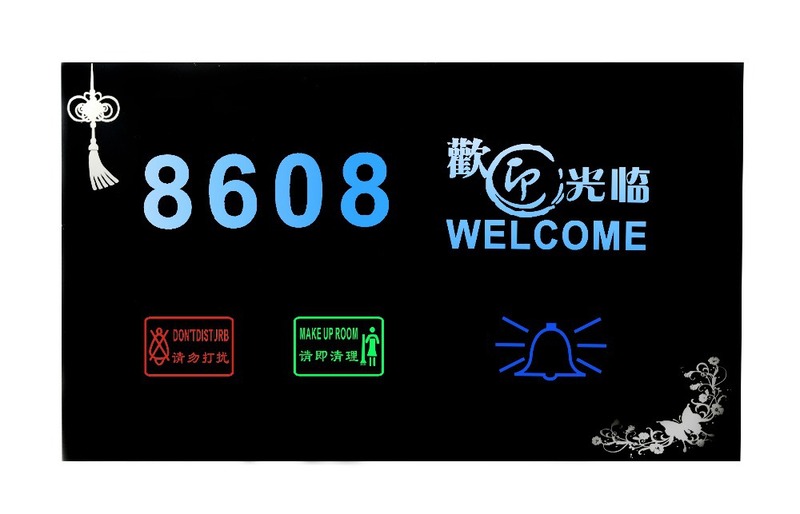 This electronic door plate is designed for hotels. 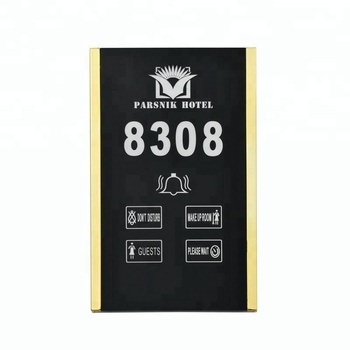 It displays room number with LED display which is clear and easy to recognize. Besides, it integrate "Do not disturb" and "Please clean" indicators. 1) When guests want the room to be cleaned, just press "clean" switch, and the "Please clean" indicator will light. When waitress see that indicator, he will know the room need to be cleaned up. 2) When guests do not want to be disturbed in the room, just press "do not disturb" switch, and the "Do not disturb" indicator will light, also the electonic doorplate will be locked. Touch doorbell won't work during this period. 3) The doorplate integrate capacitive touch screen door bell switch, press the door bell switch will drive the ringring door bell to ring. In this case, traditional doorbell button is unneccessary. 1) Use the screw driver to screw off the fastened metal plate. 2) Fasten the metal plate on bottom case. 3) Install the door server wiring correctly. 4) Fasten the door sever on fastened metal plate. 5) Tighten the screw from the side bar. A: This is customized production, it needs about 10 to 20 days after confirmed the design. Q: What information should be provided before order ? A: your hotel logo source file (in cdr, AI format), hotel room numbers. 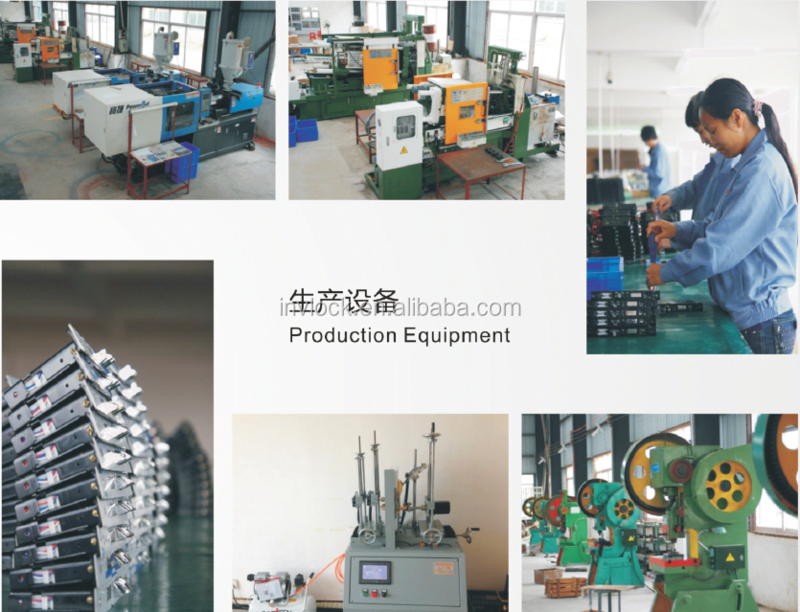 A: For customized production, please pay 70% advance deposit after confirmed the order; 30% balance before shipment. A: MOQ for customized production is 20pcs. Q: is it wireless ? A: No, it is not wireless, it connects with electric wire.